A great designer’s work is never done, and this is why we warn you that no builds are final until all is said and done. 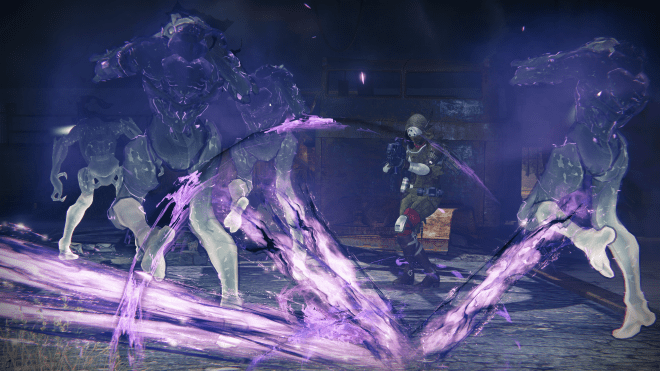 Having said that, we’ve seen some changes to the new subclasses – some good, some not so much. We’re going to do our best to spell out in simple terms what changed, and give a brief analysis of the new perk’s benefit vs. the old perk’s benefit, as well as to provide other relevant or pertinent information that will help you decide on how you feel about these changes. Let’s get started right away with the Nighstalker! 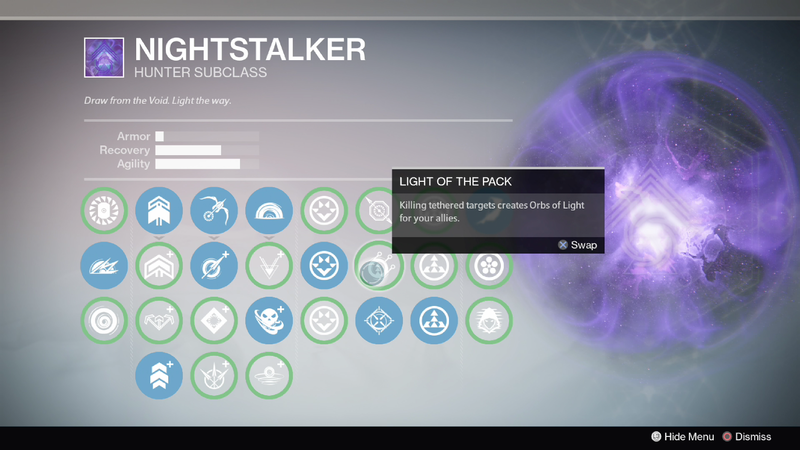 If you’re curious, click here to check out the old subclass talents. 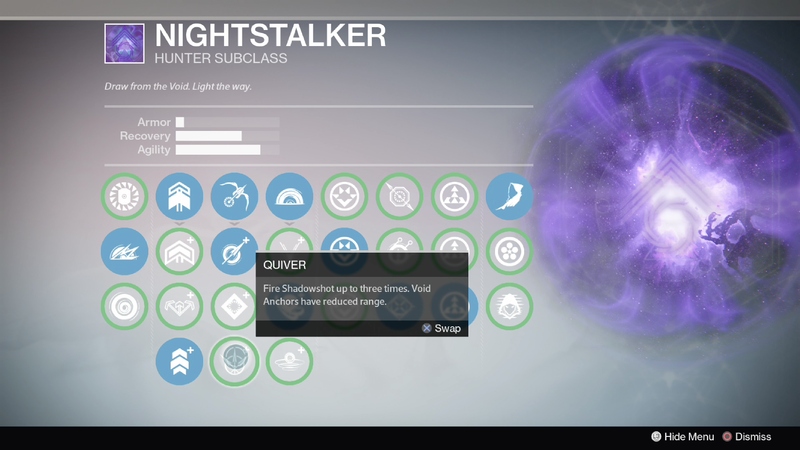 Want to see Nightstalker in action? Click here to watch Patrick’s Shield Brothers Strike footage! No perk effects were changed here. “Slash Grenade” was simply renamed “Voidwall Grenade.” While it’s doubtless more accurate, some might argue it’s a little too on-the-nose… Oh well. No changes here. Bad news for anyone who was hoping to see Blink come to the Nightstalker; good news for literally everyone else. NEW Blood Bound: Tethered enemies explode when killed. Damage to tethered enemies is shared to all. Replacing Inextricable, Blood Bound ups the ante by adding a bloom effect to any enemy unlucky enough to be killed while anchored to the initial Shadowshot. Not only that, but with the new description “Damage to tethered enemies is shared to all”, we have the distinct impression that your damage will be spread out much more generously. Of course, this is conjecture, so take it with a grain of salt. Obviously, all of this is an improvement over Inextricable – including the name – so Nightstalkers rejoice! 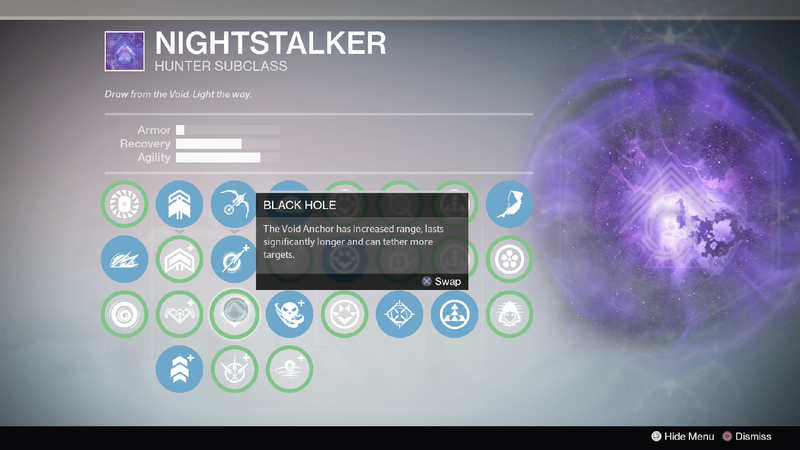 NEW Black Hole: The Void Anchor has increased range, lasts significantly longer, and can tether more targets. Wait For It is gone from the Super tree, and instead we’re given Black Hole, a Shadowtrapper-esque, very CC-friendly perk that looks like it will make tethering bigger groups of foes a breeze. This has excellent potential in PvE, as well as in larger 6v6 PvP content. We expect it to be ideal for sequestering a group of troublesome baddies while you deal with what’s on your plate, only to be able to return to find them flailing helplessly in the gravity of your Void bow. NEW Quiver: Fire Shadowshot up to three times. Void Anchors have reduced range. We’re very sad to see Gloamranger go. This replacement instead seems to be a transplant of Rapid Shot from the Class Talent column. Like its predecessor, it’ll be ideal for PvP game modes in which you couldn’t care less if anyone is tethered, and simply want to have the ability to kill three Guardians assuredly. To reinforce this idea, Bungie is nerfing the length of your tethers as if to say: “Well, you wanted to just kill things.” We’re not sure how viable this will be in PvE, as Super damage, while always appreciable, often isn’t on-par with the difficulty of the content at hand. Most of you might want a little more reliable CC. NEW Envenomed: Adds a toxin that damages enemies within the smoke. Okay, so we lied. 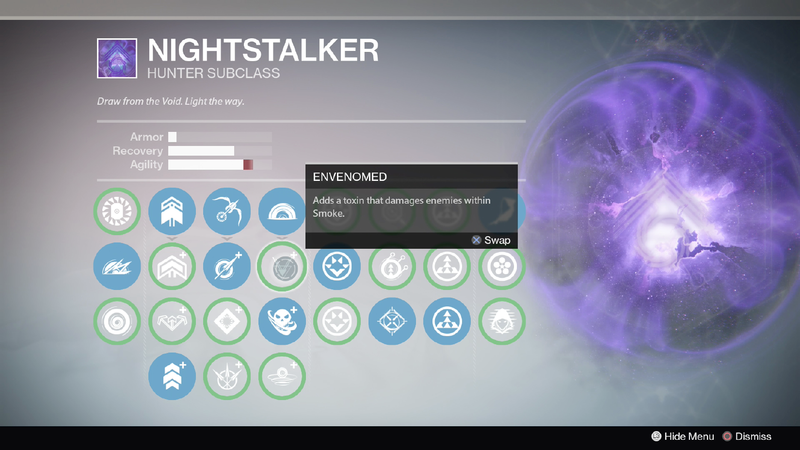 This is a slightly renamed “Envenom” with an updated perk description to assure that, yes, “suffocates” does in fact mean “damages.” You also unlock it first, now. 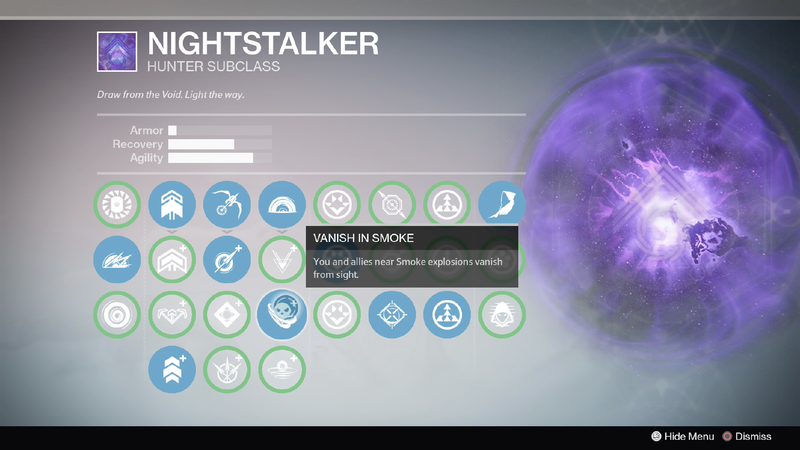 NEW Vanish in Smoke: You and allies near Smoke explosions vanish from sight. 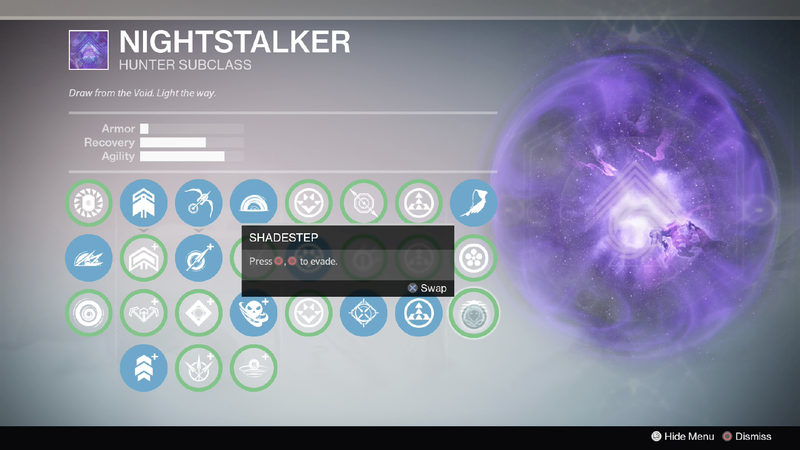 Lest we be accused of crying wolf, this is absolutely a new trick in the Nightstalker’s bag, and a powerful one at that. Pub-stomping Control crews are going to love coordinating blitzes on their hapless opponents with a couple of well timed Vanish in Smoke parades, and raid teams headed into King’s Fall will be equally pleased with the chance to get a breather from Oryx’s minions. We expect this to have plenty of PvP and PvE utility, and think it’s an excellent last-minute addition. The Nighstalker keeps getting scarier and scarier. These are all unchanged, and are in fact unchanged on every single subclass. You can expect the same base stats available as you could a couple of months ago, and as such we won’t be mentioning this in further section for the other subclasses. For the record, these are not official names. We will refer to the column between the stats as the “passive” and the right-most column as the “class” for ease of reference. NEW Courage of The Pack: Killing tethered targets increases Recovery and Armor for you and nearby allies. Stacks up to 5 times. The talent previously called “Uncanny Archer” is getting an understandable nerf. 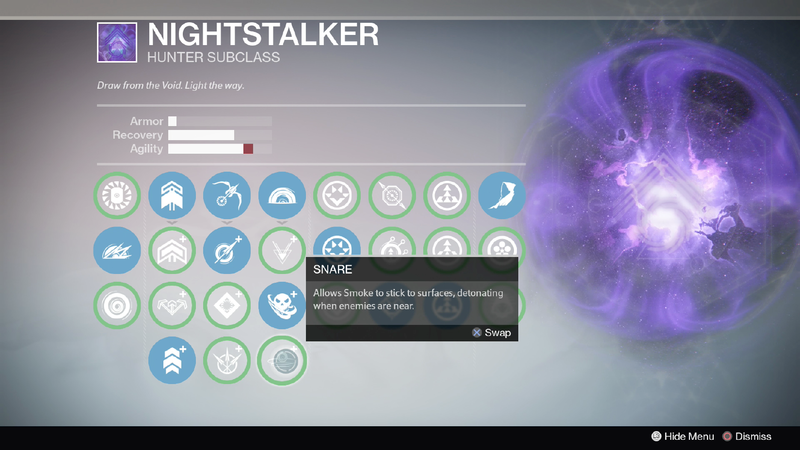 Before, while it could only stack three times, it activated upon tethering and not killing, and was specified as lasting until the next Shadowshot. On top of that, it also natively reduced Shadowshot’s cooldown. As we mentioned in our first overview, this was borderline overpowered from an even theoretical standpoint. Now, you have to make sure to finish off whomever you tether, and while we can’t be certain the buff doesn’t last just as long, the ambiguous language makes us think the buff lasts considerably shorter. And they straight up did away with the CD reduction. It’s at least poised to have excellent synergy with the new Black Hole. NEW Light of the Pack: Killing tethered targets creates Orbs of Light for your allies. 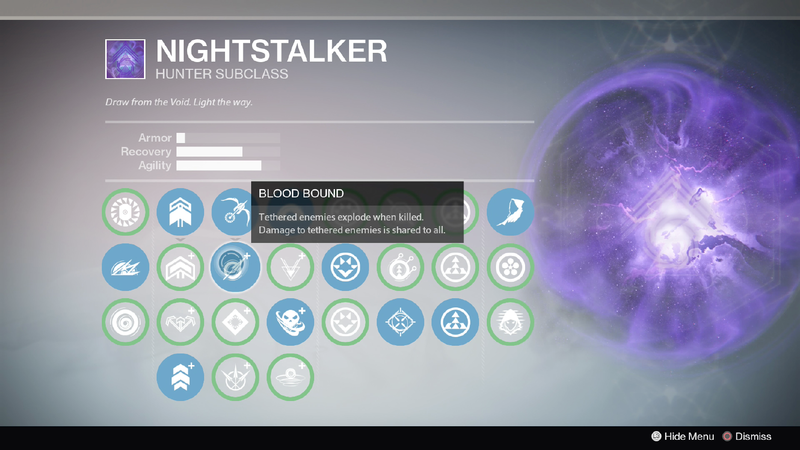 A very fireteam-friendly perk, this seems to address the Hunter’s considerable lack of orb-positive Super potential in the current PvE metagame. We’re uncertain if it has to be the Hunter who finishes off each foe in order to create the orb of light; if that’s not the case, this will require some careful micromanagement on your fireteam leader’s part in order to ensure the benefit. 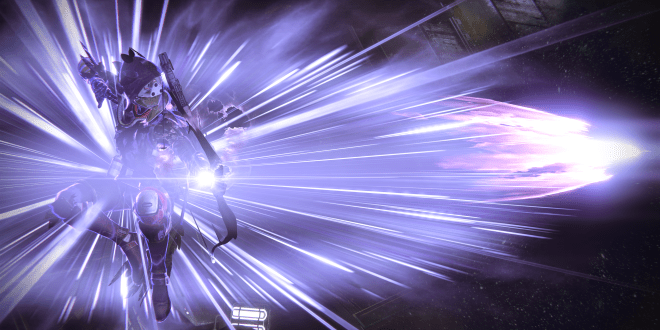 In PvP, it may be of some use when you manage to snare a couple of Guardians from behind – though attempting to tackle anything more than two foes by yourself is a tall order. NEW Lockdown: Grenade and Smoke effects last twice as long, allowing strong territory control. It’s distinctly different from Well-Provisioned, in that it no longer provides a second grenade. Instead, you’re given more duration for your Smoke. While we won’t argue this a zero-sum trade-off, it perhaps can be understood in terms of balance. Two grenades has been proven to be an obscenely powerful ability… perhaps Bungie wants to limit the amount of Grenades flying in Mayhem? In any case, it’s a great buff for Smoke, and would pair nicely with Vanish in Smoke. 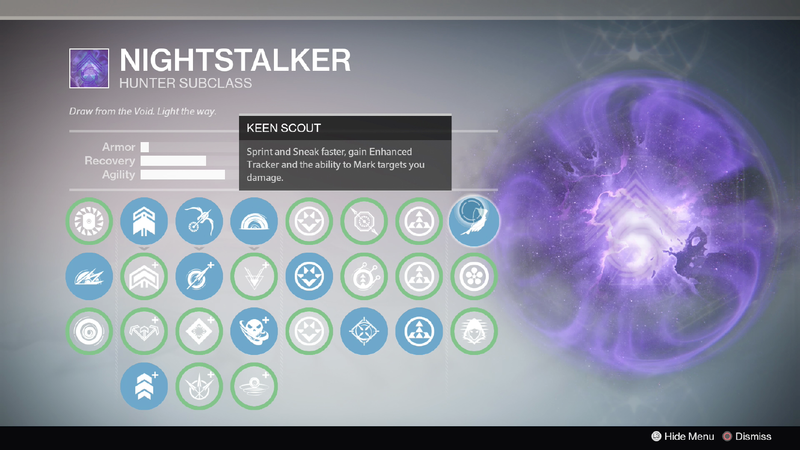 NEW Keen Scout: Sprint and Sneak faster, gain Enhanced Tracker, and ability to Mark targets you damage. While the perk title is not new, there are a couple of noteworthy changes. The first is that you will not only “sneak” faster – again, this may just mean walk while crouched faster – but you will also sprint faster. Think Fleet-footed from the Bladedancer tree. The second is that any mention of allies gaining “waypoints” to the targets you mark has been removed. While we never got to really learn what this meant, it must have proved too confusing for the design team, and it has been scrapped. The increased sprint speed makes this change an overall buff. NEW Predator: The Void Anchors fired from Shadowshot become traps that stick to surfaces and wait for prey. As Rapid Shot has been renamed to Quiver and shipped to the Shadowshot tree, Predator takes its place, a renamed version of ‘Wait For It’ from the original Super tree. 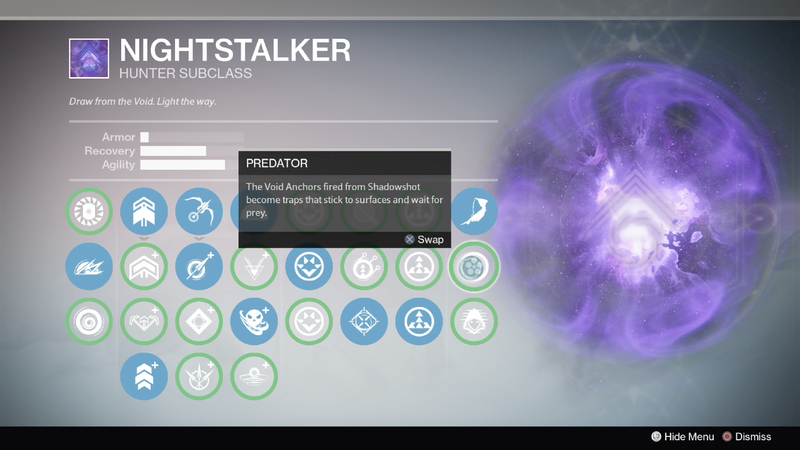 This perk cements Nightstalker as the true “trapper” class of Destiny. When combined with Snare, you’ll have two out of your three abilities available for remote detonation simply when an enemy comes in proximity. This gives you the ability to control an engagement long before it actually begins – an undeniable boon in almost any encounter. Gloamranger was essentially discarded entirely. 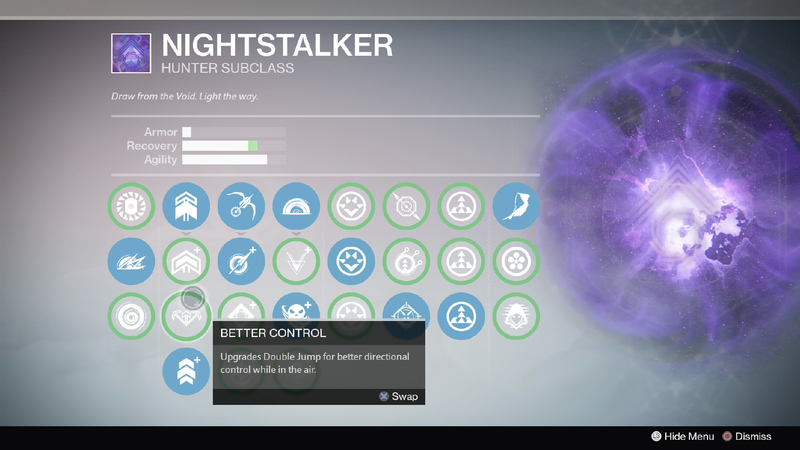 Now, the Nightstalker no longer has the potential to buff outgoing and reduce incoming damage. 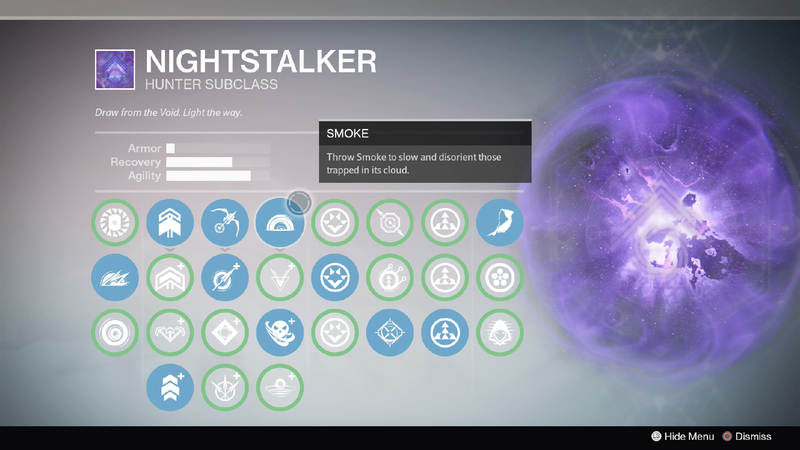 While this is a loss for the Nightstalker, the decision can be understood in terms of re-focusing the class’s role. There was likely too much overlap with the Defender Titan for Bungie’s comfort, and Predator simply fits the class better from a design standpoint. 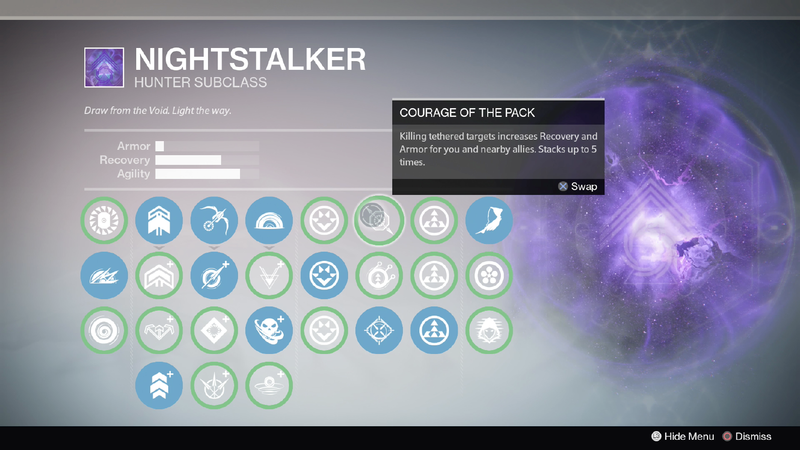 Uncanny Archer’s change to Courage of the Pack fits a similar theme; your Nightstalker loses some defensive and longevity potency that would have made him or her considerably tankier. From the Melee tree, Smog is now absent, which means you will have no way of increasing the radius of your Smoke through your talent tree. 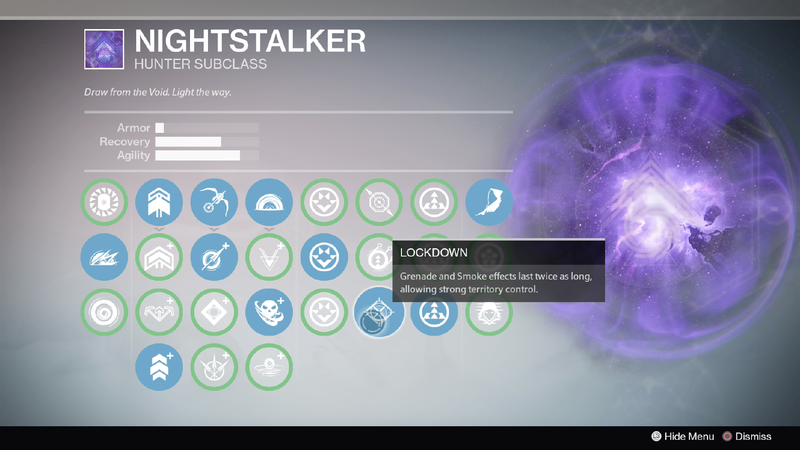 This will require better aim on the part of the Nightstalker, but your potential consolation prize is double the duration if you select Lockdown. Well, you’ve seen the changes, and now it’s time to decide for yourself. 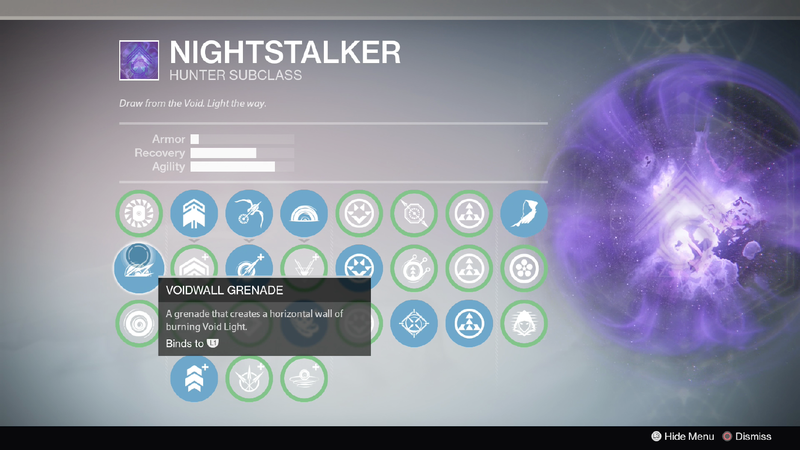 Are Nightstalkers better off than they were a couple of months ago, or did Bungie botch the redesign? We find it a little funny that both of the perks we mentioned as being potentially unbalanced were, in fact, re-balanced! 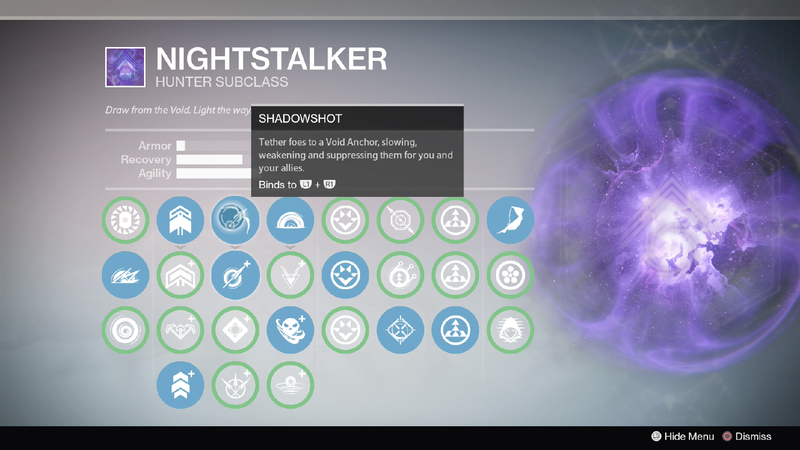 Let us know if you’re as excited as ever for the Nightstalker, or if the Sunbreaker or Stormcaller are calling your name now! But remember, those classes have changed too. We’ll have just as detailed an analysis for each one of them shortly.